These sterling silver Claddagh earrings feature inlaid Connemara marble along with Trinity knots. 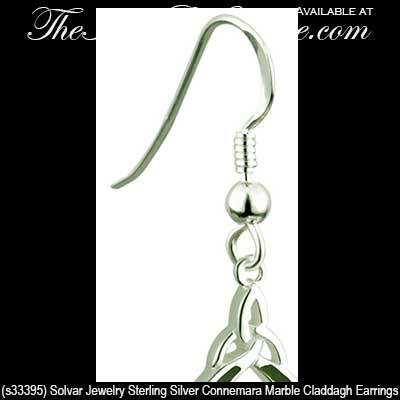 The Irish drop earrings on fishhooks measure 3/8” wide x 1 3/8“ tall, from the bottom of the heart to the top of the wire, and they are gift boxed with the Claddagh legend along with Celtic Knot and Connemara marble history cards, complements of The Irish Gift House. 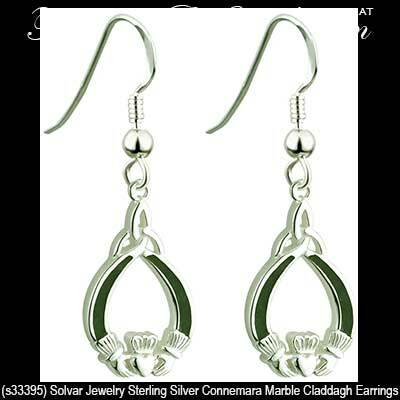 These Connemara marble Claddagh earrings are part of the Fáilte Ireland Collection from Solvar Jewelry and are made in Dublin, Ireland.